Amplify your interactive ad arsenal with the latest technology trends. The coolest ad technologies aren't the ones that cost the most--they're the ones that engage users. Thankfully, this year's crop of cool tools doesn't require the kind of attention your MySpace page does. From reaching people on their mobile to enhancing your online videos, these innovative ad trends can set you apart as a tech-savvy company while reaching users right when they're ready to buy--and encouraging them to buy more. While you may think of "airline check-in" or "mail tracking" when you see the black-and-white squiggles that make up QR, or "Quick Response" codes, these 2-D data matrices are beginning to find their place in advertising. Already popular in Japan and parts of Europe and the United States, these square-shaped codes can turn a plain old paper ad into an opt-in part of your campaign. Customers scan them with their camera phones to get a hidden plain-text message, a person's contact info, a redirect to a mobile website, or a song or image download. One QR campaign developed for the clothing industry by Philip Warbasse, founder of Los Angeles-based Warbasse Design, puts the codes on in-store apparel that allows shoppers to purchase sizes not in stock--right on their phones. The codes also offer customers a same-day in-store coupon, and other codes in the campaign help upsell the customer with a discount on a second item in the store if they buy it the same day. 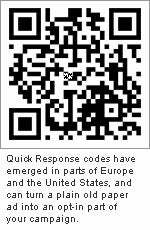 Since QR codes cost essentially nothing to produce, go create your own and download a reader for your phone while you're at it from i-nigma. You can create simple promotions like coupons inexpensively and quickly. One caveat is making sure your promotion will appear on customers' phones as you intend it to, which means hiring someone with mobile design experience if you're offering anything other than a plain-text promotion. A QR campaign will work best if your audience includes lots of tech-savvy mobile aficionados, but as an early adopter, you may also be able to garner interest from people unaware of the technology. Customers may be curious about the spotted squares, and you may even be able to parlay your new campaign into press about your business's cutting-edge ad techniques. If you've already started making online videos related to your products or services, adding overlay ads--or letting customers create them--is almost a no-brainer. With overlays, instead of just slotting in pre-, mid- or post-roll ad spots that nobody wants to watch, your ads become a part of the content, Pop-Up Video style. "The more relevant you can make an ad to the content, the more the ad becomes the content. And this, in turn, drives far higher click-through rates," says Robert Lane, whose Ottawa-based business, Overlay.tv, is making overlay technology more accessible to businesses. The company allows anyone to take an online video and create overlay links in it for free. Then it gives you the code to embed your video on any website. Overlay.tv's affiliate program also gives incentives to third-party content creators to link to your products. Soon, customers will be able to click on ads like these during their favorite TV shows, making product placement even more marketable. "Commercial TV, like you know it now, will be history in five years," says Warbasse. "Stage display, seamless point-and-click advertising is going to be all the rage." Though much has been made about Bluetooth's ad capabilities since it started gaining popularity on people's cell phones, it has only recently become a viable advertising technology. More than 60 percent of North American mobile phones sport Bluetooth and many new laptops and other portable gadgets come enabled with the beaming tech. Through Bluetooth, consumers can download coupons, short videos and audio files. They can then forward the content to other Bluetooth users with a P2P connection. It's most effective at targeting consumers as they're entering stores or theaters, walking around trade shows or attending sporting events, since shoppers are particularly receptive to getting coupons right before they buy a product. Prime Point Media, a Norcross, Georgia-based company with a network of more than 700,000 Bluetooth-enabled outdoor ad spots that has carried ads for Pepsi and the U.S. Navy, sees high response rates for its ads. Prime Point president, Karen Robinson, says rates of 13 to 20 percent are typical because of the ads' relevance, street-level position and call to action. Bluetooth isn't just for large companies, either. Robinson says a multi-month campaign can start as low as $5,000. She says the secret to using Bluetooth advertising effectively is having compelling, relevant content and not abusing your relationship with consumers. 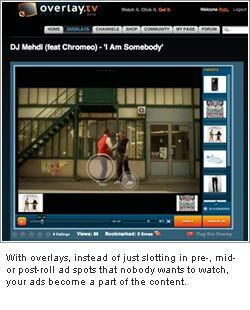 Other up-and-coming ad spaces are also providing new ways to reach potential clients on their mobiles. Jangl, for one, offers ad-sponsored, number-free text and voice messaging through social networking and dating sites--similar to how Yahoo! tacks on ads at the end of its users' mail messages. And as digital billboards continue to become more sophisticated and interactive, they're offering a lot of creative, albeit power-gobbling, options for advertisers, though their price points tend to be a bit high for independent businesses. As ad technology continues to change and new ad spaces open up, keep your ear to your mobile, your Bluetooth on and your camera at the ready. And don't shy away from trying something new.